Few phones have managed to leave such a lasting impression in the mobile world in recent years, as the original Moto G. The budget smartphone redefined what can be achieved in a budget-friendly Android phone and sparked a whole new wave of devices, offering advanced functionality in and affordable package. The original Moto G took markets by storm back in 2013 and the first part of 2014 (in the UK it singlehandedly put Motorola on the map), but it also made quite a few competitors reconsider their approach to the market segment and the second-gen faced far tougher competition. 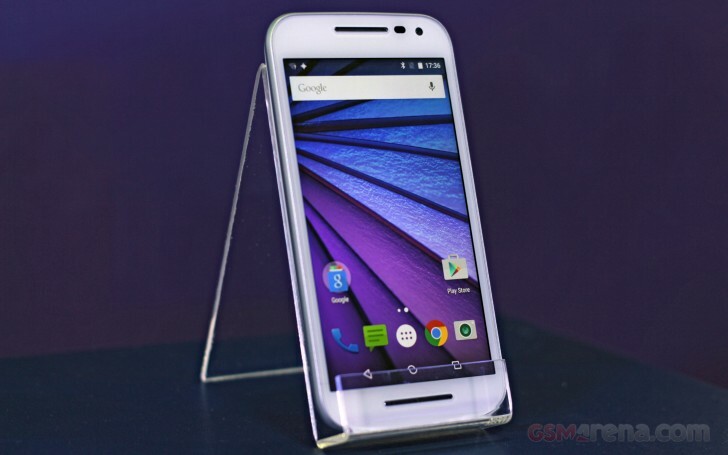 That's why the second Moto G had a far tougher time replicating the success of its predecessor. Still, bringing a larger, 5.0-inch screen and a microSD card slot, it managed to further solidify Motorola's reputation as a king of the budget segment.We also saw LTE and dual-SIM variants, which extended the appeal of the lineup in certain markets. So is this going to be another step in the right direction or will Motorola's golden run end? On the surface, changes brought by the Moto G (3rd gen) aren't that many but most of the key areas have seen improvements. The old Snapdragon 400, which has powered the lineup through two versions, has been swapped for the 64-bit Snapdragon 410. The new SoC might not run at higher speed or have more cores than its predecessor, but its 64-bit nature lets it take full advantage of Android Lollipop and the new ART virtual machine. The CPU architecture is new too, and we already saw that alone brings a notable performance boost. The GPU upgrade on the other hand is rather small - from the Adreno 305 to the Adreno 306 and as leaked benchmarks showed the performance is more or less unchanged. As previously rumored, The Moto G finally got a RAM boost. The higher end version, which also comes with 16GB of onboard storage now has 2GB of RAM. That should notably improve multitasking and performance with heavier apps. Sadly, the smaller 8GB version is still stuck on 1GB RAM. Yet another change is the camera setup. This has been an area of constant improvement for the Moto G - from 5MP is the first iteration, to 8MP in the second and now all the way up to 13MP. This is actually the same sensor found inside the Nexus 6 and while the Google purebred is not quite the best shooter in the market, its camera should easily be among the best in this particular price range. We got to take a few shots with it and upon first inspection, quality looks really promising. Still, we are going to save our comments for the full review once we get the unit in our office. Finally, Motorola has thrown in a bigger 2,470 mAh battery, so hopefully it will offer even better power autonomy than its predecessor. It's worth mentioning though that it's not all upgrades - there is now only one loudspeaker on the device, which is a step back. For what it's worth though, the phone still sound pretty loud. After handling it for a bit, we can say that the Moto G (3rd gen) feels very similar to its predecessor, which is by no means a bad thing. 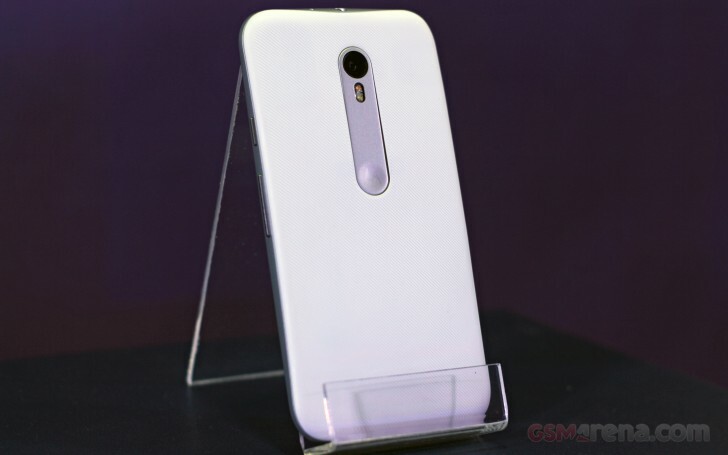 That special Motorola vibe we talked about earlier is still present, even though the exterior is slightly changed. The signature pair of bars above and below the 5.0-inch 720p screen are present, although with a different, more subtle styling. In fact, the whole front side seems somewhat cleaner than the second generation and reminiscent of the first one, with all the sensors neatly aligned beside the earpiece. The back is where most of the visual changes have occurred. The texture on the removable back cover feels identical, but the camera module has been redesigned and definitely stands out from the rest of the body. The flash is no longer round, which is natural, considering that it is dual-LED and dual-tone. There is no nasty, protruding camera bump and the signature logo dimple is safe in its place, just where any avid Motorola fan would want it to be. Last, but definitely not least, the Moto G now has an IPX7 rating for water protection. This means that the phone can handle up to 30 minutes of submersion in 3 meters of fresh water.